The Ohio Housing Finance Agency (OHFA) offers several affordable loan options to help you achieve your dream of homeownership. OHFA offers 30-year, fixed-rate FHA, VA, USDA-RD and conventional mortgage loans with generous income and purchase price limits designed especially for homebuyers with low- and moderate-incomes. If you are not a first-time homebuyer, click here to learn more about OHFA's Next Home program. 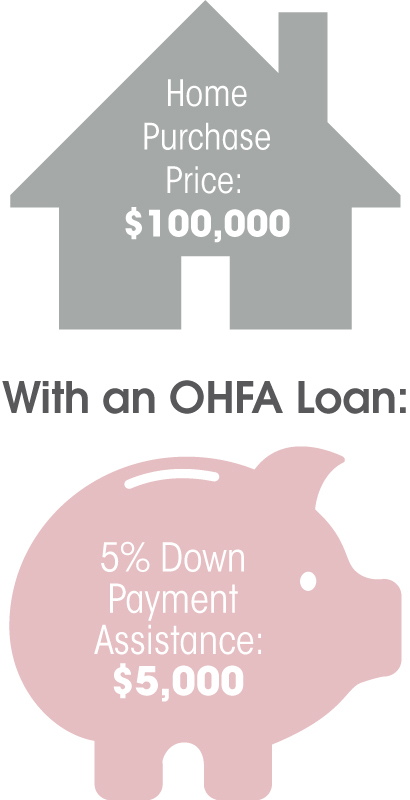 How Do I Apply for an OHFA Loan? OHFA loans do not come directly from OHFA. We work with lenders, credit unions and mortgage companies across the state to offer loans to qualified borrowers. Find an OHFA-approved lender in your area, along with tips to help you with the application process, or call us toll-free at 888.362.6432. You have not had an ownership interest in your primary residence in the last three years. You are an honorably discharged veteran. You are purchasing a home in a target area. Please view a complete list of eligibility criteria. Which OHFA Loans are Right for Me? Qualified buyers are required to complete free homebuyer education. OHFA's streamlined education program allows you to complete a course offered by any U.S. Department of Housing and Urban Development (HUD) approved counseling agency in Ohio. Please note, OHFA homebuyer education is not completed until after homebuyer has submitted their loan application with their loan officer. Homebuyer Education is not required for borrowers who are only registered for our MTC Basic program.